Disc 1: "Mountain Fortress," "Julesburg," "The Argonauts"
Disc 2: "Border Showdown," "The Outlander," "The Travelers"
Disc 3: "Decision," "The Storm Riders," "Rendezvous at Red Rock"
Disc 4: "West of the River," "Quicksand," "Fury at Rio Hondo"
Disc 5: "Star in the Dust," "Johnny Bravo," "The Last Train West"
In the 1950s, a posse of popular Warner Bros. TV Westerns galloped into American living rooms: "Maverick," "Sugarfoot," "Bronco," "Lawman," "Colt 45." The sagebrush rage began with "Cheyenne," an epic series of gunblazing action and panoramic prairie vistas that ran for eight top-rated seasons and helped turn a nation of accountants, housewives, sales clerks and kids into armchair cowpokes. This DVD set contains the complete first season, 15 episodes that pit the laconic hero against rustlers, outlaws, hostile Indians, a crooked sheriff and trigger-happy hooligans. Bullets scream, wit and fists fly, justice prevails. And, as the dust settles, riding off to new adventure is Cheyenne Bodie (Clint Walker), six-and-a-half feet of cowboy brawn, courage and integrity. 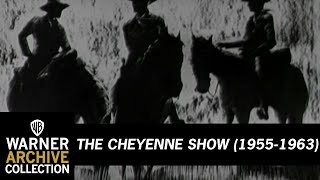 One of the most popular shows of the Golden Age of TV Westerns, CHEYENNE followed the adventures of Cheyenne Bodie (Clint Walker), a strong and silent frontiersman seeking unsuccessfully to avoid trouble and live peaceably in the lawless West. Moving from job to job, Cheyenne inevitably encountered a steady stream of villains, outlaws, gunfights, and beautiful women. The acting and writing for the show was comparable to most westerns of the time, but what sent the show skyrocketing to the top of the ratings chart was the hunky physique of the six-foot-six Walker, whose shirt seemed to come off in every episode. In the debut season of the show in 1955, Cheyenne had a loyal sidekick named Smitty. I was just a little kid when Cheyenne was on, and he was my favorite cowboy. And realize this, that is no small statement when you understand that the 1950s was on T.V. absolutely cowboy territory. If memory serves me well, I'd say on average in the 50s the three major networks, ABC, CBS and ABC all had on at least one western T.V. show each and every night of the week.So imagine the competition! This one was a great one. No cowboy was more solid than Cheyenne in his cool, tough, steady, yet gentle attitudes. Warner's made good use of out-takes from some of their major westerns of the years before, particularly for episodes with Indian fights to make the show seem shot on a bigger scale than would have been practical. But it all came off quite good when professionally put together with the star Clint Walker. It may also be worth notting here for fans of James(Maverick-Rockford) Garner, that in this first season of discs he shows up several times, just before getting his own chance in Maverick, which I certainly hope to see offered here soon. In any case, if you are a fan of westerns, and i can't imagine why you would be reading this now if not, you won't be disappointed in Cheyenne.